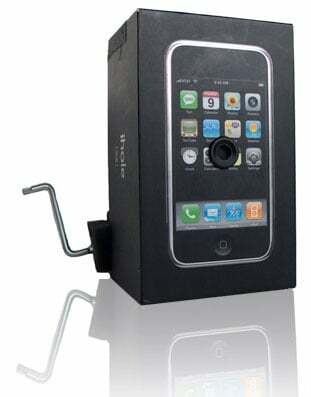 Most iPhone owners probably just chucked the handset's box in the bin seconds after leaving the shop. Not designer Scot Hampton - instead, he turned Apple's packaging into a film camera. Hampton’s dubbed his design the iHole and describes it as “a revolutionary analogue photographic device constructed from the recycled packaging of digital technology”. Register Hardware’s not convinced it’s revolutionary, but his combination of packaging, tape, tinfoil, a piece of foam and a leftover Ikea allen key is certainly unique. On his website, Hampton describes each step required to make your own iHole, including the use of a marker pen to blank out some of the letters in iPhone, which are printed on the box, the make the word “i Hol e”. The design requires you to poke a small hole in the box’s front for the lens, which is filled with a combination of tinfoil and a rubber washer. 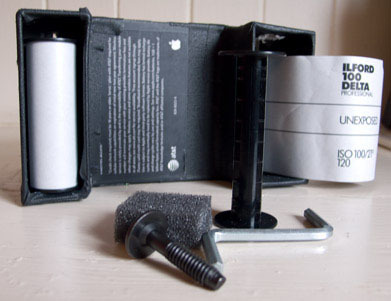 Film is then fed through the box from right to left, like in a traditional camera, by the allen key, which turns a hole in the film canister from outside the box. The design requires various amounts of tape to make the box light-tight, but Hampton brags that it is a reusable camera. Hampton’s posted a picture on his website that was taken by his iHole and, although it’s black and white, it’s still pretty impressive, despite the obvious lack of any megapixels. If your iPhone's box is still kicking around, then why not get busy this weekend and make your own? Or build your own camera out of other packaging. Drop us a line here to tell us how you got on.